CUBE a german bicycle manufacturer released a Urban Bicycle Concept. The result of the coperation with the University Coburg/Germany (Productdesigner Gregor Dauth, Professor Gerhard Kampe) shows a 28″ wheel folding bike. CUBE has a sportive bicycle portfolio. So the customers are focused on a sportive urban bicycl concept. The lightweight urban bike can easily carried into the flat and the working place. Interesting to see that also here a internally geared hub with 8 speed is used (See also Cannondale Sram Projekt ONE with a Sram i-MOTION 9 hub). The hole drivetrain is completely capsuled. This protects the chain from rain, dust,….. I cannot understand that there are so many urban bicycles on the market who disregard this fundamental necessity! 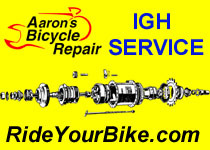 The HEBIE Chainglider is a revolutionary invention and nearly no bicycle maufacturer uses this fantastic part. Also in this bike concept the essential urban fenders are missing. Who wants to ride with this bicycle to work on a rainiy day! Sorry!!!! Maybe most of todays urban bikes are looking better without fenders and capsuled a drivetrain but when you face real world the cool design will not protect the designer cloth from getting dirty. The 28″ rear wheel can be released out of the frame. The rear pinion gear and the rear brake disc rests on the frame. This means the rear wheel looks more or less like a front wheel. There are no additional parts on any side of the hub. This has the advantage, that no oil or dirt from the rear pinion gear can touch your clothes and it´s much thiner part to store. Also interesting to see that the rear brake disc is mounted on the derailer side. This is the opposite side compared to actual bicycles. Do YOU have any idea why? The Shimano Alfine hubstrip is online. The hub was part of a Downhill bike. I estimate that the hub was around 400km in use. All internal parts are greased with a white grease. Even the filigree ratchets which is very unusual. On a few pictures you´ll see metal dust on the white grease as a result of a massive metal abrasion. This is a normal process in the beginning of a hub life. The internal parts are new machined and do not fit perfect into each other. In the first kilometers of usage this “shake down” process produces a lot of metal dust. For a long hub life it´s important to clean an regrease the hub. To optimize the efficiency of the hub it´s necessary to use grease and oil for the different internal parts. Shimano uses 100% grease inside the hub. This has the advantage of long maintenance intervals. The grease will last a whole hub life! transmissions (figs. 7, 9, and 12). I´ll give you feedback about my experience. One of my hubs is running since 7 month with special lubrication! Check also movie 1 (original greased hub) and 6 (special oil lubricated hub) for the differences according ease of rotation. Details are stored on the Alfine static page.